The greatest care has been used in the creation of content of our Internet pages. However, we cannot warrant that the content is correct, complete and up-to-date. As a service provider, as required by general legislation we are liable for our own content on these pages according to Section 7 (1) of the Telecommunications Media Law (TMG). However, in accordance with Sections 8 to 10 of the TMG, as a service provider we are not obliged to liable monitor third party information transmitted or stored, or to investigate circumstances indicating unlawful activity. Obligation to remove or block the use of information according to the general legislation remains unaffected by the above. Any liability in this respect is, however, only incurred from the moment we obtain knowledge of a specific breach of law. When we become aware of such breaches, we will remove the affected content immediately. Contents and works created by the web site operator on these pages are subject to the German copyright. 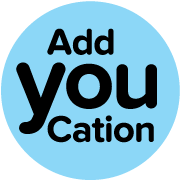 Copying, editing, distributing and any type of use outside of the boundaries of the copyright law require the written agreement of AddYouCation. Downloads and copies of these pages are permitted only for private, non-commercial use. Insofar as the operator has not created the contents of these pages, the copyrights of third parties shall be observed. In particular, the content of third parties is identified as such. Nevertheless, should you become aware of a copyright violation, we request that you notify us accordingly. Upon becoming aware of breaches of rights, we will immediately remove the affected content. The use of our website is usually possible without providing personal information. If data relating to individual persons (such as name, address or e-mail addresses) are collected on our pages, this always takes place as far as possible on a voluntary basis. These data are not passed on to third parties without your express permission. We would like to point out that the transmission of data on the Internet (e.g. during communication per e-mail) may involve security risks. It is not possible to fully protect data from being accessed by third parties. We hereby expressly object to the third party use of contact data that has been published in accordance with the legal requirements on the editor for the transmission of not expressly solicited advertising and information material. The operator of the web pages reserves the right to take explicit legal measures in the event of unsolicited delivery of advertising information, for example spam. Plugins of the social network Facebook, 1601 South California Avenue, Palo Alto, CA 94304, USA are integrated into our pages. The Facebook plugins can be recognised by the Facebook logo or the Like-button on our pages. An overview of Facebook plugins can be found here: http://developers.facebook.com/docs/plugins/. When you visit our pages, a direct connection between your browser and the Facebook server is created. Through this connection, Facebook receives the information that you have visited our Web site along with your IP address. If you click on the Facebook Like-button while you are logged into your Facebook account, you can link to the content of our pages on your Facebook profile. By you doing this, Facebook assigns the visit to our pages to your user account. This web site uses Google Analytics, a web analysis service of Google Inc. (“Google”). Google Analytics uses so-called “cookies”, text files that are stored on your computer and that enable the analysis of your use of the web site. The information generated by the cookie regarding your use of the web site (including your IP address) is transferred to a Google server in the US and stored there. Google will use this information to evaluate your use of the web site in order to generate reports regarding web site activity for the website operator and to provide further services associated with the web site utilisation and internet utilisation. Google may also forward this information to third parties, to the extent that this is required by law or where third parties process this data on behalf of Google. Under no circumstances will Google link your IP address with other data stored by Google. You may prevent the installation of cookies by using a corresponding setting on your browser software; we would however point out to you that in this case you may not always be able make full use of all the functions of this web site. By using this web site you declare your agreement to the processing of the data concerning you collected by Google in the manner described above and for the purpose named above.